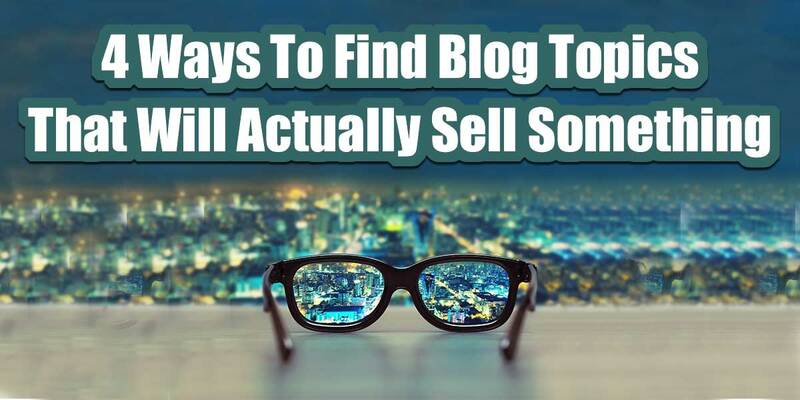 Once you have done SEO for a while you can kind of, sort of figure out what keywords to use for a blog post. Now, don’t get me wrong, for important posts I make sure to check the Google Keyword Planner tool to make sure that I have the best version of a keyword to match the best SEO keyword for search, but otherwise I can sort of fly through the process. That said, sometimes I need a bit of help. Maybe I know the topic that I want to talk about (which today is going to be blogging planners). 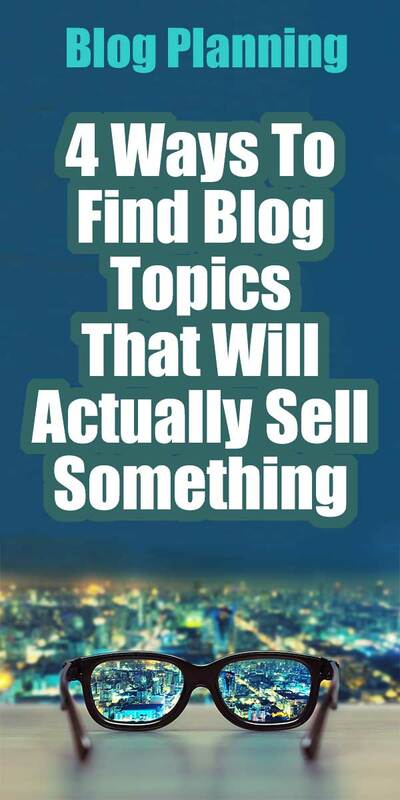 But then I really want to find blog topics that are going to be good for sales, not just content marketing, which can be a little trickier. So I have a down and dirty way to do a quick blog planning run through, using a bunch of different site search tools to get my gears turning writing-wise and then making sure that the topics I am going to post about are going to be interesting to buyers. So I always like to start with Google so that I can get a good idea of what general searchers are looking for. Because they have been around so long and are the main searching tool for everyone, it just makes sense to start here! So I found out a couple of things, that “blogging planner” is better than blogging plan. 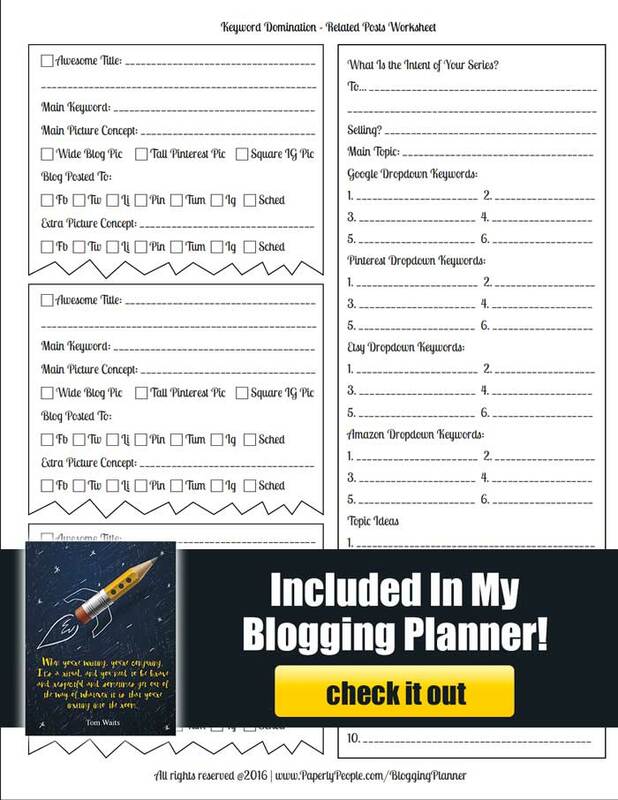 And that “blogging planner printable” is another good keyword that I might not have really been aware of… score! Because my planner is a PDF to print out, I also found a keyword that I don’t want, “blogging planner app”. Now unless I am doing paid google ads, that is not all that helpful but interesting to note! Next I am going to do a search to see how many sites I am competing with. You do this by simply adding ” marks around your keyword which forces Google to ONLY show those sites that have those keywords in that order. Now I am not scared of 42,000 competing sites, but WOW are those low numbers for blogging plan (which seems less commercial) and blogging planner printable which seems like rock star keyword that I will want to target in my sales page. My next stop is Pinterest. While may not seem like Pinterest is as commercial as a couple of the others, it is the “dreaming” site for mostly women who are planning out their futures. Filofax is a kind of commercial planner in a size that I don’t make, but that is going to be interesting for future product development ideas. Not all sites are great for all searches and before I do this search just let me say that I am not sold that it will be a great reward. And I was right. This was not a great fit for Amazon, but I have to tell you that sometimes there are amazing keywords when you use the Amazon search. Plus this is the first purely commercial site I have tried. I feel like that commercial intent is HUGE when you are actually trying to sell something as opposed to just doing content marketing. As bad as I thought that Amazon for this search was going to be, I KNEW that Etsy was going to be a gold mine on this one! 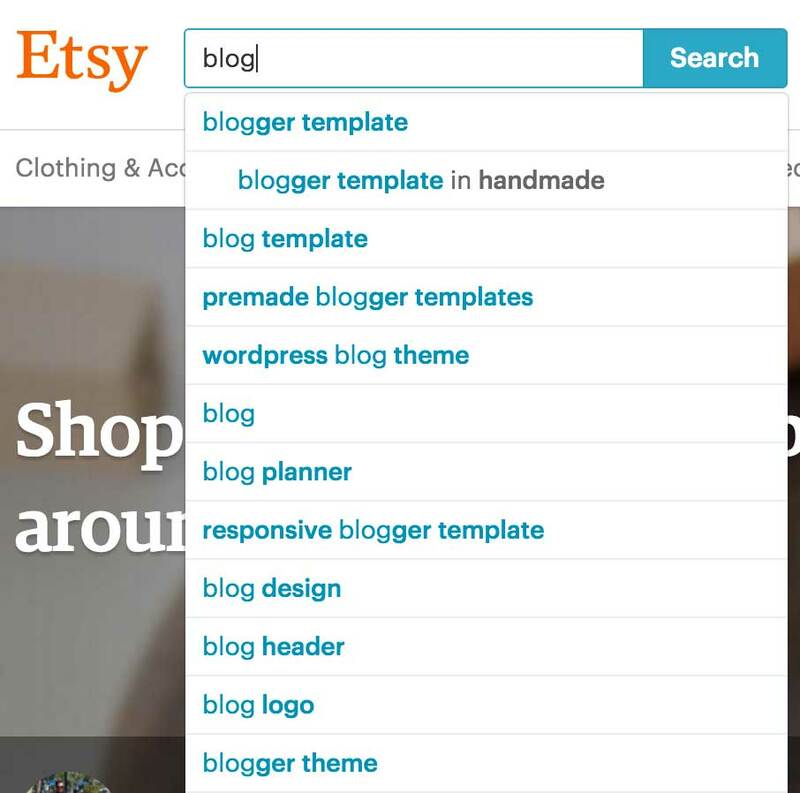 Ohhhh isn’t this interesting…just doing blog as I was typing they have “blog planner” instead of “blogging planner”…. hmmm that is really something to think about! Okay, now what? What are you going to do with this data that you have? I use one of my blogging worksheets to note all the keywords that I have picked out and then I will brainstorm blog post titles that I want to write using those keywords. 10 Titles. Generally I like to have 10 titles to work from starting with the truly horrible and then getting to really good ones as my brain kicks into gear during the brainstorming process. 3 Blog Posts. From those 10 I pick three that I am actually going to write based on the keywords that I have targeted as important to me selling something! Hopefully this has helped you to see how you can do some serious keyword research fast and with a whole of focus! If you are interested in being a boss blogger, you can check out my blog planner here!